Grilling out is a favorite summer past time of mine, The smells, sounds, beer, and music are all some of my favorite aspects of the summer. This recipe combines two of my favorite Outdoor grilled foods and merges them into one. I fell in love with bratwurst during the one month stay I had in Germany during December 2013. I learned that there is a variance and tradition to Bratwurst all over Germany. Everything from the type of meat to spices are subject to change from region to region. 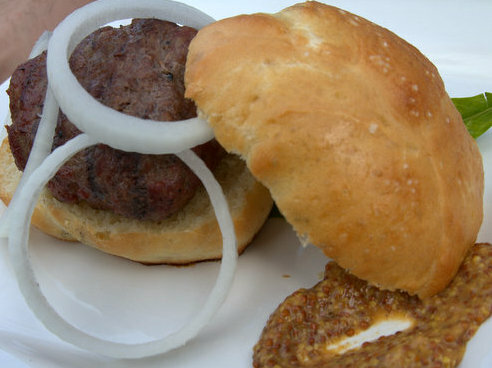 A beautiful mixed meat Bratwurst comes out of Coburger in the Bavaria region. Coburg Germany’s version of the bratwurst is made with at least 15% beef or veal, and uses lemon zest, nutmeg, salt, pepper and egg as a binder. 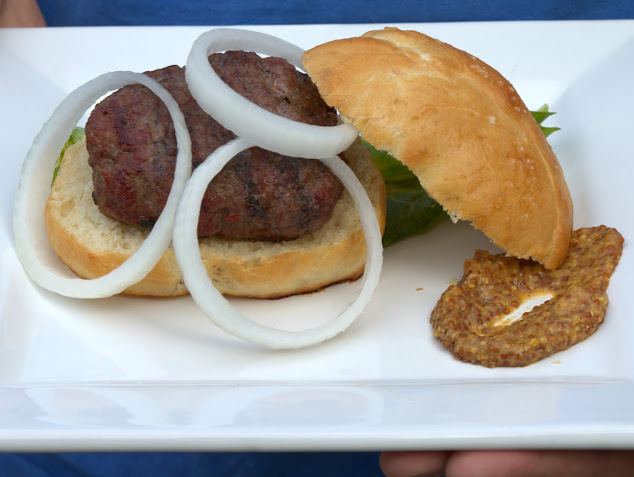 Also “In Germany, the Coburger Bratwurst is grilled over a pine-cone fire.” (German Food Guide) Our version of the Coburger Bratwurst Burger is % 66 ground pork and %33 80/20 beef. We do away with the egg, because the salt helps the proteins bond “When you salt meat and knead it, proteins in the meat become soluble. That soluble protein gels when the meatball is cooked, binding it firmly together.” (Arnold) In addition, I replaced smoking pine cones with mesquite wood chips, the familiar wood used in an agressive backyard smokey flavor. Mix beef, pork, and seasonings in a large bowl, then let mixture sit for 1 hour covered in refrigerator. Weigh out patties into 6 quarter pound patties. 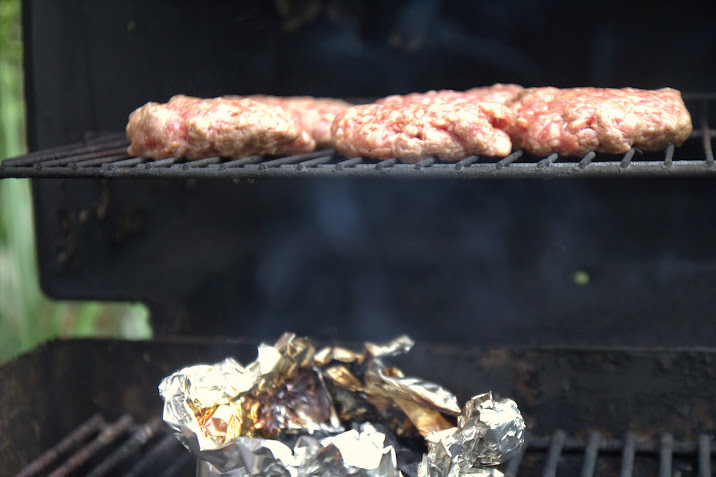 Set up the wood chips in aluminum foil, place over direct heat of the grill and wait until it starts to smoke. Place patties on a grill above the smoke packet and cook until internal temperature is 165, the process should take roughly 30 minutes, but always check the temperature of your burgers with a sterile instant read thermometer. "Coburger Bratwurst ." German Food Guide, n.d. Web. 14 Aug. 2014. <http://www.germanfoodguide.com/wurstdetail.cfm?wurst_number=7>. Arnold, Dave. "Dave Arnold on Meat Glue-Meatballs and Gluten-Free Cooking." Eater. Eater, 3 June 2011. Web. 14 Aug. 2014. <http://eater.com/archives/2011/06/03/ask-dave-arnold.php>.